Darwin may not be the golfing capital of Australia, or anything like, but it does have a handful of very reasonable golf courses, should you be based here and looking to play a round or two. Located within the Marrara area, on the northern side of the airport and right next to the North Lakes Shopping Centre, the Darwin Golf Club enjoys a unique setting and welcomes visitors. There is also a floodlit driving range sited here (open from 06:00 until late) with bunkers and greens, should you need the practice. There are also a number of well-designed 18-hole courses within one or two hour's driving distance of the city. 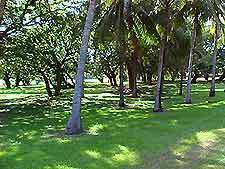 The Darwin Golf Club is home to an exceptional championship 18-hole course, with excellent facilities, such as long fairways lined by palm trees, spectacular views of the surrounding countryside, lush grass, manicured putting greens and inexpensive golfing fees. Covering around 6,050 metres / 19,850 feet, the club has a par of 72 and a number of challenging holes. The Gardens Park Links is a popular nine-hole course, suitable for all levels of player. Located in the city and close to the Botanic Gardens, the Gardens Park Links also features an 18-hole miniature course. 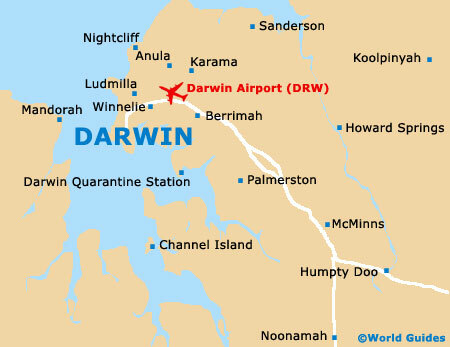 The RAAF Darwin Golf Club features an excellent nine-hole course, covering around 5,400 metres / 17,700 feet. With spectacular fairways, a par of 69 and good facilities, this is the perfect course for both novice and more experienced players.